There's no doubt it's a landmark in the valley south of the village of Walnut Creek. 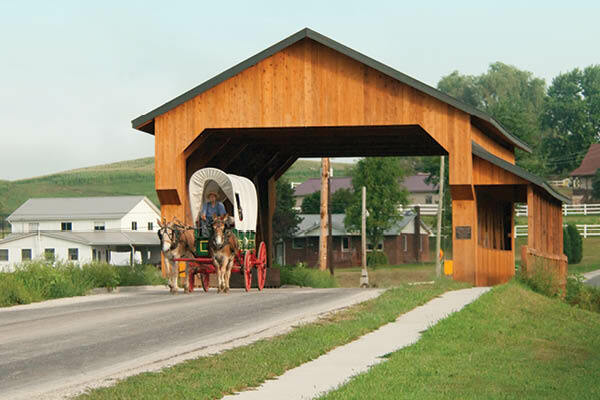 Yes, it's that beautiful wooden covered bridge, located at the bottom of "the Walnut Creek hill" on County Road 145, just steps from the historic Walnut Creek Mennonite Church. In the early 2000's, it was clear the aging cement bridge that crossed the Walnut Creek was in dire need of repair. With increased traffic from heavy vehicles, it was clear that something needed to be done. And soon. The brainchild of Holmes County Commissioner and Walnut Creek resident, Joe Miller, the idea of a covered bridge was floated to replace the old bridge. In October of 2007, state and federal grants were approved for the construction of a landmark that would be of interest to visitors and accommodate the heavy traffic of the county road. The design was completed by Richland Engineering, and was completed in the fall of 2009. The covered bridge is 55 feet long, nearly 15 feet high and about 26 feet wide. The wooden structure originally weighed 75 to 82 tons. It was constructed by local craftsmen and most of the materials came from Holmes County. With the main supplier being Keim Lumber in Charm, construction contractor Jonas Erb built the bridge along with the help of five men at a cost of $800,000. Holmes Country company V.O. Menuez & Sons bridge builders was the general contractor on the project. Huge oak timbers support the structure with siding and railing constructed of cedar and Douglas fir. The roof is slate steel shingles. It is strong enough to support semi trucks and recreational vehicles. Construction took approximately 50 days. For covered bridge enthusiasts and experts, the Walnut Creek bridge features Multiple King Post Truss. Visitors may park in the adjacent parking area to take a closer look at the bridge. When the bridge was being constructed, the community was encouraged to submit names for the structure. Overwhelmingly, the community requested that the bridge be named for Jonas Stutzman, the first settler in the Walnut Creek. Now called Stutzmans' Crossing, the bridge lies on property formerly owned by Jonas Stutzman. 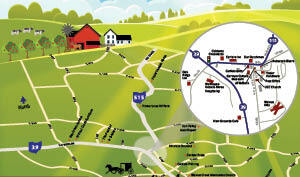 His farm lies across State Route 39 and has a historical marker commemorating the log cabin he built for his family in 1809. Somewhat of a character, Jonas was known as "Der Weiss" and was an unconventional Amishman. He is said to have worn white clothing (as opposed to traditional black or dark clothing) and authored a book prophesying when Jesus would come back to earth. Jonas also donated the land to build the first meeting house (church house) in the area at Walnut Creek Mennonite Church. In 2017, the bridge was temporarily closed to add steel reinforcement to the cross members of the bridge. Visit the German Culture Museum in Walnut Creek or the Amish and Mennonite Information Center in Berlin to learn more about the history of Walnut Creek and the eccentric habits of early settler Jonas Stutzman.